A Coca Cola plant is spewing out raw or partially-treated sewage and toxic industrial waste into a pond surrounded by agricultural fields near Delhi, the Centre’s top green watchdog has said. The Central Pollution Control Board (CPCB) has indicted the Hindustan Coca-Cola Beverages Pvt. Ltd (HCCB) after three of the four clean-up plants at its Hapur (UP) facility were found to be defunct. The plant has been running without the requisite ‘consent to operate’ for a year, the CPCB has said in its inspection report. Granted after periodic audits, the consent is a key safeguard against environmental degradation. 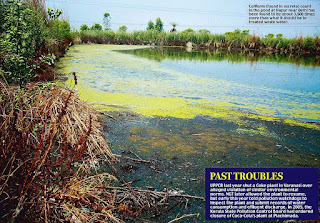 The inspection, ordered by the National Green Tribunal (NGT), found a 75m x 75m pond was overflowing with effluents. There was a growth of mosquitoes and flies. The coliform (found in excreta) count in the pond was about 3,500 times more than what it should be in treated waste water. Water quality in the pond - with inlet and outlet at the same corner - quality is also poor on organic strength indicators. The NGT ordered the inspection after a lawyer in July this year filed a petition against government agencies in Uttar Pradesh, complaining of groundwater contamination - a public health hazard. The plant, 45 km from Delhi, throws out 1,900 KLD (kilo litres a day) of industrial waste water and 100 KLD of sewage. HCCB is not yet party to the case. It came into the picture only during the inspection in October. The tribunal will hear the case next on December 7. HCCB, in a statement to Mail Today, said it operates its plants in compliance with all regulatory norms. “HCCB, not being a party in the matter before the NGT, hasn’t been served with a copy of the stated [inspection] report. Thus we are unable to make any comment,” said the statement. HCCB is the bottling investments group of the US-based beverages giant with plants engaged in manufacture, package, sale and distribution of a slew of beverages across India. The inspection report - a copy of which is with Mail Today - was filed before the NGT on November 19. “We will wait to get a copy of the report, study it in totality and respond accordingly,” said an HCCB official. 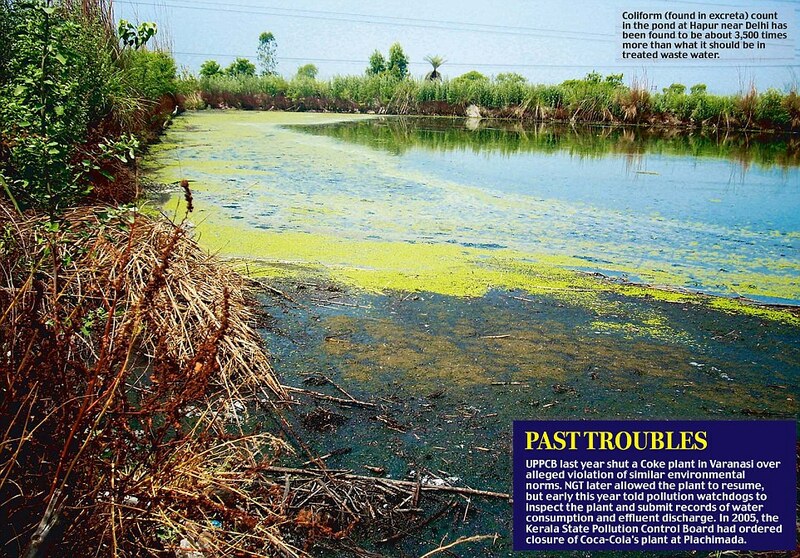 After the petition was filed, the Uttar Pradesh Pollution Control Board (UPPCB) in July informed the tribunal that only cleaned-up waste water was being flown into the pond. The Uttar Pradesh State Industrial Development Corporation Ltd (UPSIDC) went a step ahead a month later and said that the petitioner should be fined heavily. This prompted the NGT in September to ask the country’s top pollution watchdog CPCB, under the union ministry of environment and forests (MoEF), to do an inspection at Mussoorie Gulawati Rd industrial area set up by UPSIDC. “The discharge from the plant is partially treated or untreated. There are two effluent treatment plants (ETPs). The one in the pulp section was found defunct. Both sewage treatment plants (STPs) were found defunct. The plants need to ensure all its ETPs and STPs are functional. Only after that there should be any discharge,” said a senior CPCB official. This is a major water polluting industry but there is no facility for online monitoring of the quality of effluents, the report says. No papers were produced to show hazardous waste (burnt oil residue etc) was being sent to a dedicated facility for safe disposal, it says. 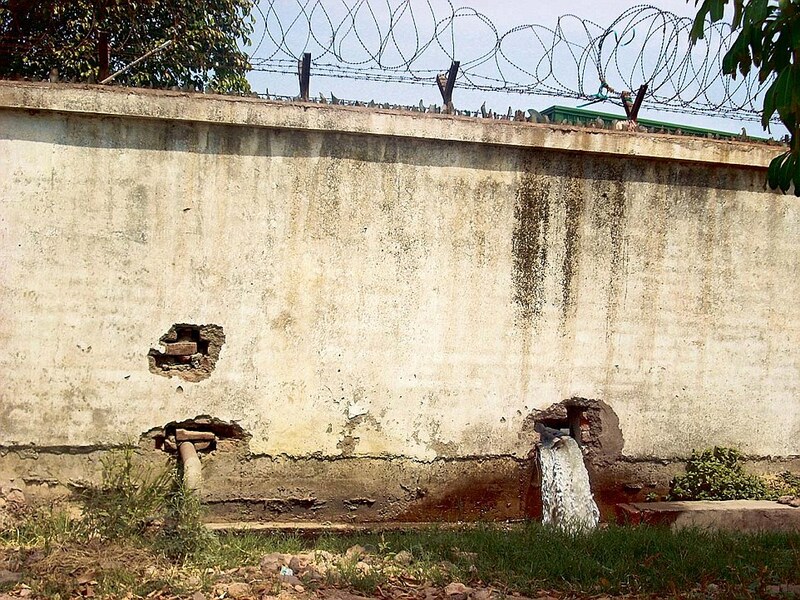 The poor quality of groundwater that has coliform and excess iron content could be because of defunct clean-up systems and discharge from other industries, the CPCB official said. The report says safe drinking water should be ensured to villages in the vicinity on polluter-pays-principle. 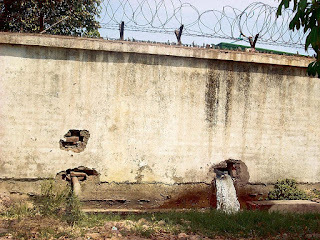 It has also indicted UPSIDC for a messy drainage system, resulting in discharge from various industries into agricultural fields, saying farmers complained that the soil in their fields has become infertile. UPSIDC should completely revamp the drainage system in the industrial area, the report says. Coke plants in Varanasi and Kerala have in the past faced similar charges. Environmentalist Manoj Misra says it is a classic example of how and why there is large-scale industrial pollution in the country. “Why is a direction from NGT needed for environmental regulatory institutions to wake up? Strongest possible actions should be taken till the plant gets all its pollution-control measures in place,” he said. The pond was built by the plant apparently to provide treated waste water to agricultural fields, the report says. The discharge is ultimately reaching the main drain in the industrial area, it adds. “There needs to be a detailed investigation of the entire industrial complex to prevent water and industrial pollution and its deleterious impact on the surrounding agricultural fields,” Misra said.